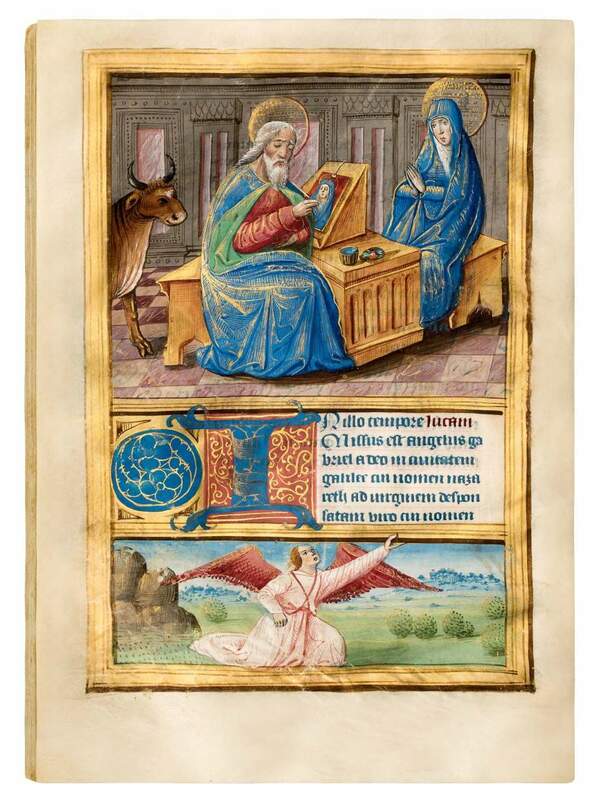 Book of Hours of Jean le Vayer, seigneur de Faverolles. Manuscript in Latin with some French on vellum. Illuminated in the circle of Jean Poyer and a second illuminator. Written in blue ink and illuminated with delightful calendar miniatures as well as 19 fully decorated pages to enhance the value of this prayer book, its owner would have appreciated the intense display of the images. The fine miniatures ‘supported’ by a range of angels reflect heavenly light and inspiration. They add a luminous quality to the manuscript. Jean le Vayer, seigneur de Faverolles sur Cher (Loire-et-Cher, 40 km east of Tours) is mentioned as a later owner. The le Vayer family was a well-known family of leading magistrates, but no more details about the manuscript's provenance are known. 175 x 120 mm. – 96 leaves, with 24 small calendar illustrations (symbols of the zodiac and labours of the month), and 19 full-page illustrations divided into two registers, with an angel below, accompanied by a large decorated initial and a decorated roundel. Lavishly illustrated in the style of the most famous illuminators of late 15th-century Tours, this is a newly discovered manuscript showing the success of Renaissance influence in carefully-modelled figures, interiors, and landscapes. The manuscript is painted by an artist who was clearly influenced by models of Touraine artists like Jean Poyer or Jean Bourdichon. His straightforward and unequivocal style, however, may have been trained elsewhere, possibly in Lyon or even Paris. The Hours of Rocherau (Tours, BM, ms. 2042), created by an illuminator localized in Paris, shows similar characteristics like incisive, graphic pen strokes and the cursory way of designing distant prospects of landscapes in shades of pale blue, highlighted with gold. Globular trees, high horizons, and serene sceneries with rugged rock formations are also typical. While human figures are resolutely outlined, treetops and shrubbery are portrayed in a pointillist manner in hues of green with golden dots interspersed. The angels that accompany each large composition in the lower register of the miniatures are equally surprising. Our master’s method of applying colours is entirely different from the velvety finish that became so distinctive for Poyer’s and Bourdichon’s workshops, but he was undoubtedly influenced by the renowned Tours illuminators and benefitted from their models (especially in the Evangelists' portraits and the Betrayal of Christ).